A new multimillion pound study, which will see the most thorough and rigorous series of tests to detect Alzheimer's disease ever performed on volunteers, is announced today (Monday 22 August). The Deep and Frequent Phenotyping study is funded by the National Institute of Health Research and the MRC and hopes to dramatically improve the success rate of clinical trials for treatments in Alzheimer's disease. This landmark £6.9million research project has been designed to identify measurable characteristics, known as biomarkers, which can detect the occurrence of Alzheimer's disease very early on in the progression of the disease - when a person may have no obvious symptoms. 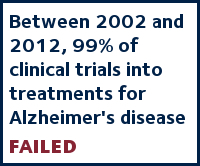 Between 2002 and 2012, 99% of clinical trials into treatments for Alzheimer's disease failed. A probable reason for the high failure rate is that treatments are being tested on those who already have irreparable damage to the brain. It is likely that treatments will be more effective in slowing or stopping further at onset of dementia at earlier stages of the disease. Also, by targeting people in the earlier stages, it should be possible to design better clinical trials for treatments that make a real difference and improve people's lives. Together, the researchers will perform up to 50 tests on 250 volunteers from Dementias Platform UK cohorts, including new tests that have never been used before to detect dementia. The tests will include wearable devices that will give researchers detailed information on people's movement and gait, and sophisticated retinal imaging that will look at subtle changes affecting a person's central and peripheral vision. We know that Alzheimer's disease starts long before it is noticed by those with the disease or their doctor. Previous studies have shown changes to the brain as early as 10 to 20 years before symptoms arise. If we can identify the biomarkers present in this very early stage, we have the chance of treating the disease earlier, which is vital if we are to prevent damage to people's memory and thinking. Some of the participants will be at risk of developing Alzheimer's disease - due to their age, genes and performance in memory tests - and other participants will not be deemed at risk. The partners involved in the study are: University of Oxford, University of Cambridge, University College London, King's College London, West London Mental Health Trust/Imperial College London, Newcastle University, University of Manchester, University of Edinburgh, Cambridge Cognition, Imanova, Aridhia, Exprodo, Sage Bionetworks, TrialSpark, Optos, IXICO, Berry Consultants, AstraZeneca /MedImmune and the Alzheimer's Society.